Ready for Truck Traffic? 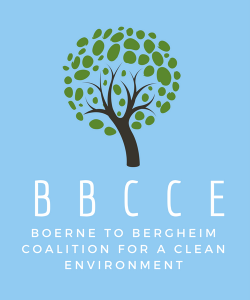 – Stop Vulcan in Boerne! Vulcan states on their website that in the first 5 years of operation, they expect to have cement trucks entering or leaving the site a total of 20-30 times per day between 4:00AM and 10:00AM, every Monday through Friday. There will also be large aggregate hauling trucks that are more than 20 times the weight of an average SUV turning in and out of this facility. Vulcan anticipates 15 aggregate deliveries DAILY. This picture was taken driving west on Highway 46 towards Boerne. The red arrow is the approximate location of the plant’s entrance. At least 50 times per day, trucks will be turning in or out of this entrance. Not only is there a hill, but the road also curves, creating very poor visibility. Heavy trucks trying to turn are going to be extremely dangerous for vehicles that will be traveling 60+ mph. Cars do not stand a chance in a collision with a cement truck or gravel hauler. Most weekday mornings, the traffic on Highway 46 as you approach Boerne is heavily congested, sometimes even coming to a complete standstill. Now imagine having all of these cement trucks with full loads heading into town.